All you need for this amazingly delicious salmon recipe is a few ingredients and about 30 minutes. It’s quick, easy and delicious. Preheat oven to 400° F and spray a piece of aluminum foil with cooking spray. In a small bowl, mix together the olive oil, parsley, parmesan, garlic and season with salt and pepper. 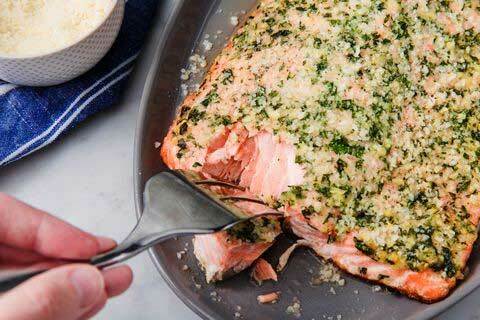 Place salmon on foil on a large rimmed baking sheet and brush garlic mixture all over salmon. Cover with foil and bake until salmon is cooked through, 15 to 20 minutes. Sprinkle with more parmesan and serve. Click here to download a PDF of this recipe.